Connecticut Historical Society had a great idea! They have a new exhibit that highlights 50 varied objects from Connecticut, along with the story of the object. The objects themselves are a varied lot, they range from a Space Suit to a Revolutionary period diary of State Hero Nathan Hale and on to a Pepe’s Pizza Box. This is one way to collect great stories from our family, pull out some random objects. When we see objects, we think of the story that connects us to the object. In your quest for family stories, if you come to a stonewall, with nothing left to tell, that is when it might help to resort to some objects. Visiting the Connecticut Historical Society exhibit could help you develop some new story leads. What memories do these objects create for you and your family. Here are some questions and associations I made when I visited. Save your family stories by learning them and storytelling with the next generation. Were you watching when Neil Armstrong stepped on the moon? What did you think, who was with you? 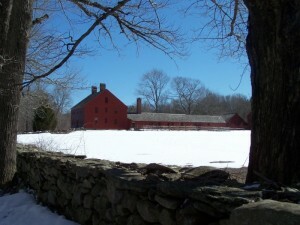 Nathan Hale Homestead is a popular school trip, but I was a docent there, that’s a different story. Do you have a Nathan Hale story? A Stanley Tape Rule, that reminded me of a time as children when we broke my father’s tape measure and tried to cover it up. Do you have a tool story? There is a P. T. Barnum Poster on display, do you have a circus memory? This item made me think of our Dutch Belted Cows, he was the first to import them.